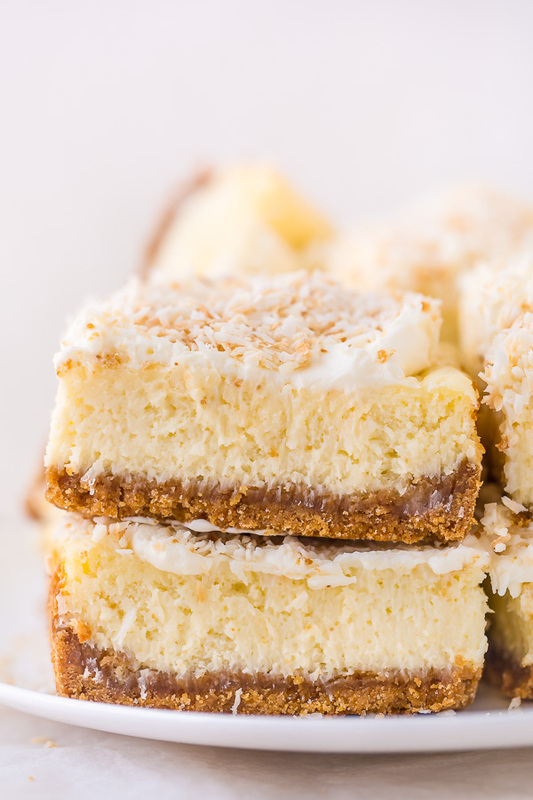 These Coconut Cheesecake Bars are creamy, sweet, and loaded with real coconut in every bite! Baked in cake pan and no water bath required, this recipe is easy and delicious! This family friendly recipe is always a crowd pleaser. Are you a coconut lover? We are! But somehow we don’t have nearly enough coconut recipes! So today we’re fixing that by adding a new coconut recipe to the blog. 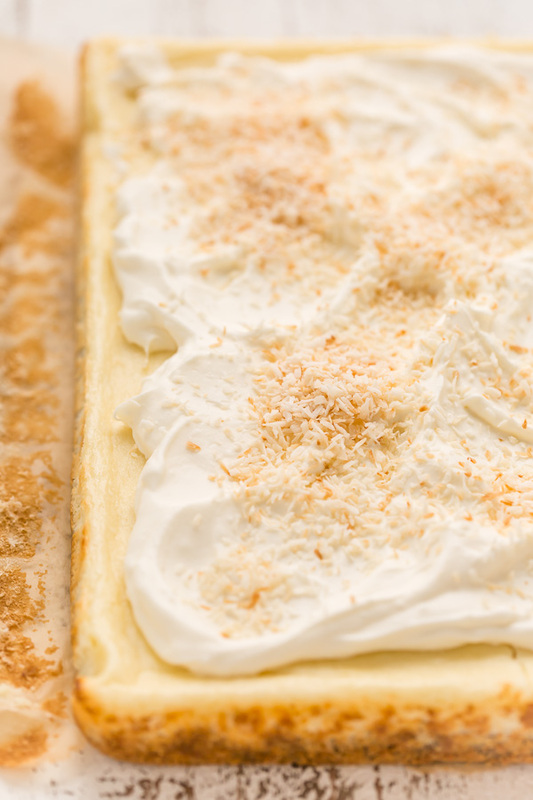 Say hello to these creamy, dreamy coconut cheesecake bars! They’re loaded with shredded coconut and flavored with coconut milk, so you know they’re exploding with coconut flavor. But the best part? The coconut cream mousse topping! And to finish it all off, these cheesecake bars are topped with lightly toasted coconut. This crowd-pleasing coconut recipe is perfect for Easter or Mother’s Day! Or any day you’re really craving coconut! cream cheese: always use full-fat!!! and be sure your cream cheese is very soft before you begin assembling the batter! sour cream: makes the cheesecake batter tangy and creamy. Again, use full-fat. sugar: granulated sugar works best for this recipe! eggs: you’ll use whole eggs and egg yolks for this recipe. coconut milk: also known as coconut cream. use the extra thick and creamy kind that comes in a can. I like Goya Cream of Coconut because it’s easily available and cheap! coconut extract: this ingredient is optional! but if you want a VERY strong coconut flavor, I highly recommend it. shredded coconut: you may use sweetened or unsweetened shredded coconut. because the cheesecake bars are already quite sweet, I prefer unsweetened.heavy cream: be sure it’s very cold. Oops! 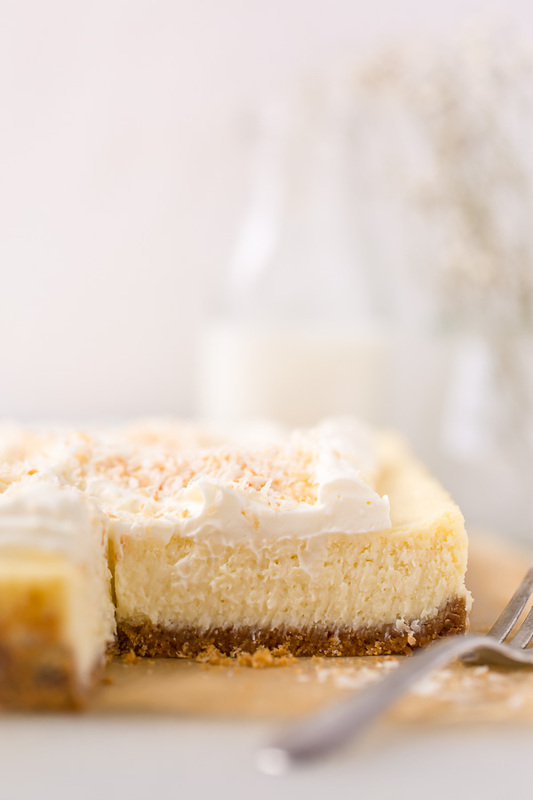 Almost forgot to tell you about the crust for this creamy coconut cheesecake! You’ll also need graham cracker crumbs, melted butter, and sugar to make the crunchy graham cracker crust! Brown sugar should not be used as a sub! You can make your own graham cracker crumbs by crushing sheets of graham crackers in a blender or food processor. Or, save yourself the extra step and buy them pre-crushed at the grocery store. The first step is to make your crust! So after you heat your oven to 350 degrees, you’ll simply combine the graham cracker crumbs, the melted butter, and the sugar, then press the down into a 9×13-inch baking tray and bake for 10 minutes. THIS STEP IN SUPER IMPORTANT IF YOU WANT A CRISPY CRUST! And we all know no one wants a soggy bottom Ok, so now that your crust has been pre-baked and is cooling, you can get started on the batter. But first! Be sure to reduce the oven to 325 degrees!You’re going to need a food processor, high-power blender, or stand mixer to make this recipe. Add your cream cheese and sour cream to the body of your electric mixer and beat it until it’s smooth and completely lump free. You’ll probably need to scrape down the sides a few times. But be patient here! Because no one wants a lumpy cheesecake. Once your mixture is silky smooth, you’ll beat in the sugar, then beat in the eggs and the yolks. Next, you’ll pour in the coconut milk and the coconut extract. Finally, you’ll fold in the shredded coconut. Next you’ll pour cream cheese mixture into prepared pan (on top of the partially baked crust) and bake for 30 to 35 minutes. Or until the the edges are set but the middle is still jiggly. Don’t be afraid to pull them out when they’re jiggly!!! I promise, they will firm up!The next step is also the hardest step: let them cool completely in the baking pan!!! At least 4 hours in the fridge. For the coconut mousses, you’ll simply whip the heavy cream, confectioners’ sugar, and coconut extract together until firm peaks form. You’ll also whip a little cream cheese, and then fold everything together. Can I Freeze Homemade Cheesecake Bars? Yes, of course! Simply cool these cheesecake bars completely, then wrap the whole slab, or slices, in multiple layers of saran wrap, then place in a freezer bag, and place in the freezer. These cheesecake bars will keep, stored properly in the freezer, for two months. Defrost overnight, in the fridge, before serving. Do not freeze with the mousse on top!!! 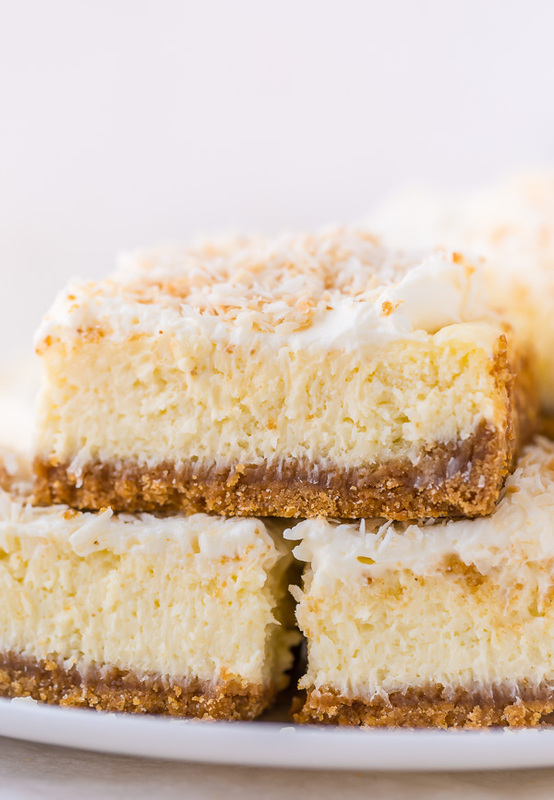 These spectacular coconut cheesecake bars are perfect for serving a crowd! Hope you love them as much as we do! AND IF YOU TRY THIS RECIPE FOR THE BEST COCONUT CHEESECAKE BARS, PLEASE LET ME KNOW! LEAVE A COMMENT BELOW AND DON’T FORGET TO SNAP A PIC AND TAG IT #BAKERBYNATURE ON INSTAGRAM! SEEING YOUR KITCHEN CREATIONS MAKES OUR DAY. Preheat oven to 350 degrees (F). Line a 9x13-inch baking pan with heavy-duty aluminum foil, allowing two of the sides to overlap (you want an overhang of at least 2-inches on two sides) and spray lightly with nonstick baking spray. Set aside. In a large bowl combine the graham cracker crumbs, sugar, and butter and, using a rubber spatula, mix well to combine. Press the mixture into the bottom - and slightly up the sides - of the prepared pan. Bake the crust in preheated oven for 10 minutes. Remove the crust from the oven and set aside on a cooling rack until needed. Reduce the oven temperature to 325 degrees (F). In the body of a high power blender, food processor, stand mixer fitted with the whisk attachment, or in a large bowl using a hand held electric mixer, beat the cream cheese and sour cream until completely smooth. Add sugar and beat until smooth, scraping down the sides and bottom of bowl as needed. Add in the eggs and yolks and beat until combined. Using a rubber spatula, fold in the coconut extract and coconut cream. Fold in the shredded coconut, mixing just until combined. Pour filling on top of prepared crust, and spread evenly. Check to ensure your oven has cooled to 325°F, then place the pan in the oven and bake for 30 to 35 minutes, or until the edges have set and the middle is still a little jiggly. The cheesecake bars will firm up a lot as they cool. Remove the bars from the oven, and cool at room temperature for one hour. Then refrigerate for at least 4 hours, or overnight. When you're ready to serve: use the foil overhang to lift the cheesecake bars from the pan and transfer them to a cutting board. Top with coconut cream, then, using a large, sharp knife, slice the slab into squares, wiping the knife clean with a damp cloth between slices. Serve at once. 1. 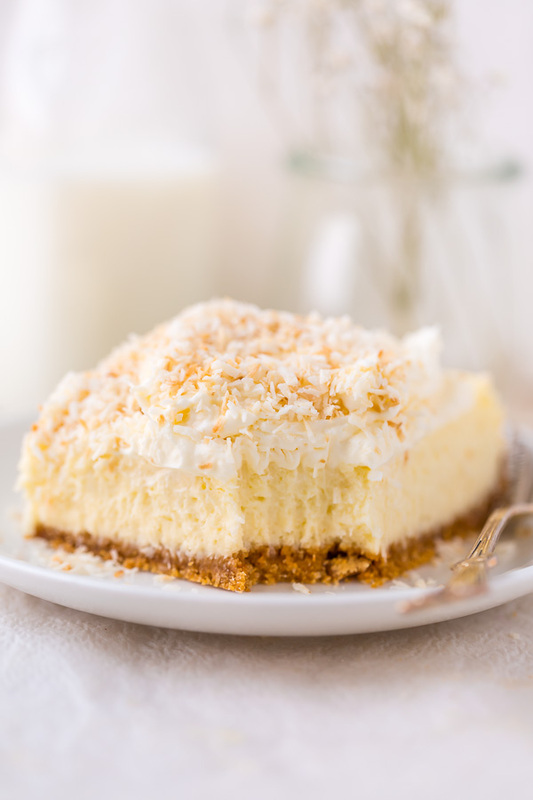 Once the cheesecake has thoroughly chilled, make the coconut cream topping. Add heavy whipping cream, confectioners' sugar, coconut cream, and coconut extract to the bowl of a stand mixer fitted with the whisk attachment and whip on medium-high speed until stiff peaks form, about 4 to 5 minutes. 2. Set whipped cream aside. In a separate bowl, beat cream cheese until completely smooth.3. Fold whipped cream into cream cheese, stirring until well combined.4. Remove cheesecake from the pan, then top with the mousse.5. Sprinkle with toasted coconut and serve! 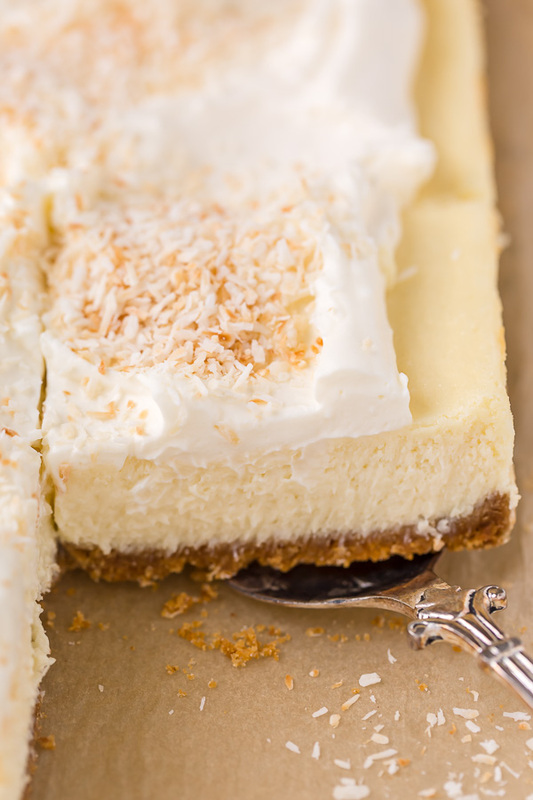 Coconut Cheesecake Bars will keep, stored in the refrigerator, for up to 4 days. You may also freeze them for up to 2 months. To freeze: fully cool the cheesecake bars, then place the cooled cheesecake (whole or sliced) on a freezer-friendly platter and freeze, uncovered, until completely firm. Once firm, remove the cheesecake from the freezer and wrap it in heavy-duty aluminum foil. Then place it in a freezer bag; seal the bag and return it to freezer for up to 2 months. When ready to serve: remove the foil and defrost in the fridge overnight. I was looking for an awesome recipe to bake for the whole family and I stumbled on this article. I read and followed the instructions carefully and I made this coconut cheesecake bars deliciously! Every member of my family is so happy! Thanks for this! Hey! I’m Ashley, a creative spirit with a major sweet tooth. Most days you can find me in my happy place: the kitchen. If I’m not there, I’m probably snapping photos of food, planning a party… or dreaming about my next trip to Paris (AKA my favorite place in the entire world). I’m a story teller, recipe developer, and photographer who firmly believes that a homemade life is a happy life. Learn More.